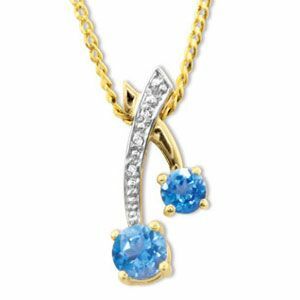 Cute 9ct gold pendant set with two bright Blue Topaz and Diamonds. 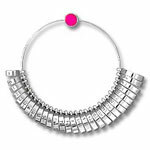 Gemstone: 4 x Diamond J colour P2 clarity 0.005 carat. Gemstone: 1 x Blue topaz Swiss round 5 mm. Gemstone: 1 x Blue topaz Swiss round 4 mm. Material: 1.1 x Grams solid 9 ct yellow gold. Chain: free gold plated chain included. Type: blue topaz and diamond gold pendant.